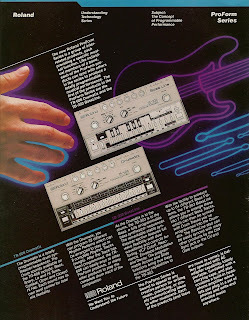 Roland Bassline TB-303 and Drumatix TR-606 from inside front cover of Keyboard magazine April 1982. I know, I know... been there, seen that. I posted this scan a while back, and the ad has been scanned by many others and has appeared on numerous sites including MATRIXSYNTH. But I never blogged about the ad, and it seemed like a good time since I had just posted the Roland Rhythm Machine brochure that came out later that same year. It made me start hunting around old Keyboard magazines to see what new and exciting 303/606 information, if any, I could dig up in order to contribute to the Internet's ever-expanding knowledge about these two units. And there is already a considerable amount of information out there - especially as far as the TB-303 is concerned. Wikipedia, Vintage Synth Explorer, and synthmuseum.com all have some great reference info, to name but a few sites. And then there are all the acid house Web sites out there. I'll never even try and 'go there' in a blog post. The TR-606 has its fair share of fans to. Again, you have Wikipedia, as well as many other sites including, but definitely not limited to, Hyperreal and Vintage Synth Explorer. But, one thing I haven't seen online is Keyboard's TB-303/TR-606 Spec Sheet promo info transcribed or posted anywhere. And it turns out that their Spec Sheet promo is a goody. Remember that Jupiter-8 Spec Sheet promo that I had transcribed for a recent double-page JP8 ad post? This 303/606 promo is just as long, and just as informative from a historical perspective. It appeared in the same issue as when this advertisement started to appear - April 1982, and is jam-packed full of good reference info. "Two new products from Roland are the TR-606 Drumatix and the TB-303 Bassline. The TR-606 Drumatix is a portable, fully programmable rhythm device that is useful for live performance, songwriting, and recording. The unit allows the user to program any rhythm desired, and program as many as 32 separate patterns containing seven different drum sounds each, with accents. The 32 rhythm patterns are broken into two groups of 16, each called up by its own switch with one additional button for pattern group selection. Programming is done either in real time by utilizing the unit's tap switch or out of real time by means of a step programming method. Written and stored in computer memory, rhythm patterns can be used to form entire percussion compositions via the unit's track write function. A total of eight tracks, seven of 64 bars each and one of 256 bars. A chaining feature has also been built into the instrument which allows adjacent rhythm patterns to be linked together for more complex arrangements. A programmable D.S. function allows for repetition of verse and chorus sections as many times as required; a D.C. Bar programs the repetition of the entire track upon completion; and two separate trigger outputs and a DIN sync connector by which the TR-606 can be connected to a variety of digital sequencers and synthesizers are included. The unit is battery-operated and includes a self-contained headphone amp for on-the-spot composing and monitoring at any location. A soft case for protection is provided. Price is $395.00. The TB-303 Bassline is another of the ProForm (programmable performance) line of instruments from Roland. It is a fully self-contained bass synthesizer with a 3-octave range. Features include two waveforms and controls for VCF cutoff, resonance, envelope modulation, decay, accent, and overall tuning. The TB-303 lets you program bass lines the same way that the TR-606 lets you program drum parts, that is by breaking them down into one-measure segments that are called bass patterns. The unit contains sufficient memory to hold up to 64 different bass patterns and also as a key bias function that can raise the key of a programmed bass pattern. This feature is useful in many rock and blues song formats that have repeated bass patterns following a I-IV-V type of progression. Patterns are programmed for pitch by using the selector switches as you would a piano keyboard. After the pitch values are programmed, timing values can be added to each note either in real time (by tapping the rhythm out on the tap switch) or out of real time through a step programming method. Programmed notes can be accented for slap-style sounds, they can slide from one note to another, or they can be tied over two or more steps to obtain longer note values. Like the TR-606, the Bassline features track writing and playing, with each track being up to 64 bars in length. Programmed tracks can be synced with the TR-606 through a DIN sync input jack for coordinated programmed bass and drum tracks. The unit also has the D. S. and D.C. features found on the TR-606 that serve to enhance flexibility and conserve track memory. The TB-303 is battery-operated and includes a self-contained headphone amp. A mix input allows other instrument like the TR-606 to be daisy-chained to facilitate remote use without the necessity of the mixer. The unit also comes with a soft carrying case. Price is $395.00. Roland, 2401 Saybrook Ave., Los Angeles, CA 90040." The Roland Rhythm Machine brochure I blogged about last week had a small paragraph dedicated to the TB-303, and it gave some indications (such as that 'instead of strings' comment) that the company really, really, really, actually expected the TB-303 to replace a live bass player. Definitely great for electronic bass, blips, and drones. Definitely not a substitute for a real bass player. So, back to the ad itself. Roland had pretty much owned the front inside cover of Keyboard magazine for quite some time with gear such as the JP-4, Saturn-09, RS-09, TR-808, and finally with that awesome 'Understanding Technology' double-page Jupiter-8 ad that ran for most of the second half of 1981 and into January 1982. A Roland VK-9 ad that had been running concurrently with that Jupiter-8 ad elsewhere in the magazine, took over this coveted front-inside cover ad-space for a couple of months, until it was finally given to this TB-303/TR-606 ad in April '82, running for the next three months or so. The advertisement itself is a bit different than previous Understanding Technology ads - probably since they wanted to differentiate these two products as part of Roland's ProForm Series of gear. But 'ProForm' as an identifier didn't seem to really go anywhere. I would suspect that maybe the SH-101 and MC-202 might have been contenders at some point in some Roland Marketing Department's 'big picture' flow chart, but it looks like Roland dropped the term and decided to go in a different direction. The Roland Rhythm Machines brochure came out only seven months later, and the ProForm identifier doesn't seem to be mentioned at all. I'll keep looking for other references to the ProForm series, but I'm doubting I'll find much. I think it was all just swept under the rug. If you know of any, let me know.